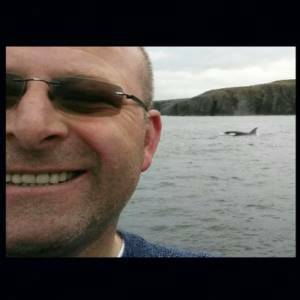 A frightening encounter with a shark and being surrounded by killer whales are among the highlights of Martin Gill’s many adventures off the Caithness coast. In this recording he talks about some of the highs and lows he has experienced in more than 3500 dives. “I loved the all colours and I loved the cold,” he says of his introduction to diving when in his early twenties, after being trained to a high standard. “I really enjoyed feeling the different environment. Martin gives a gripping account of a near-fatal incident when a dive went wrong and he lost consciousness on the seabed as images from his life began to flash before his eyes. Eventually the thought of his unborn child (wife Elise was expecting at the time) pushed itself to the forefront of his mind and he survived the ordeal. Martin goes on to talk about his involvement in a dramatic rescue operation in the Pentland Firth, and how it prompted him to volunteer for the lifeboat service. Later he reveals how he discovered a hidden cave near Whaligoe and describes it very vividly. Martin – well known to many as the proprietor of Blackstairs Highlandwear in Lower Pulteneytown – also reflects on his childhood, which included a spell in Africa. When the family moved to Wick, it took him a while to adjust to wearing shoes instead of running around barefoot!